The NBA season is almost a month in and the storylines are building. Will the Warriors surpass their own record of 73 wins? Will the Raptors win the East? The Crossover put together an early edition of buy or sell. 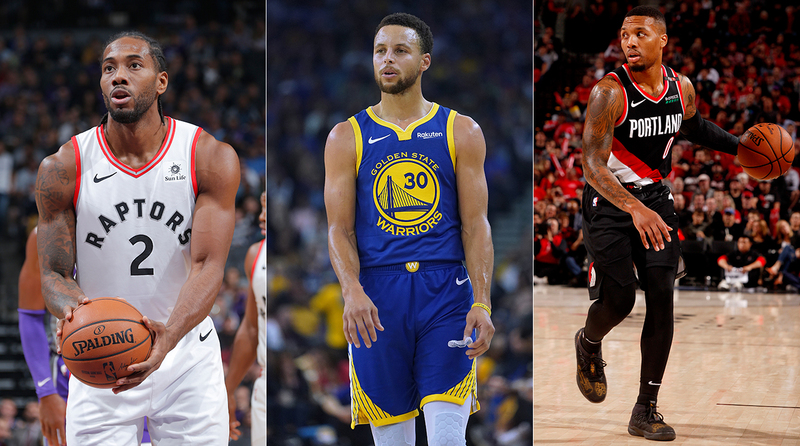 As we barrel toward the second month of the season, a few storylines are beginning to emerge throughout the NBA. Stephen Curry has latched onto an early lead in the MVP race, the Nuggets look to be a dangerous force in the West and the Wizards are sinking to the East cellar with no end in sight. The playoffs are still five months away, but it’s never too early to separate fact from fiction around the league. So which trending storylines can you trust and which should you ignore? We take a look in The Crossover’s early-season edition of buy or sell. There has been no adjustment period for Kawhi Leonard north of the border, with the Raptors sprinting out to an Eastern Conference best 11–1 record to start the season. Toronto owns the league’s No. 4 net rating and the No. 3 offensive rating, outscoring opponents by a margin of 9.3 points per game. So should we expect their hot start to last through the season? Toronto’s impressive start is no fluke. Most of the same core returns from last year’s 59-win club, and the growth of the Raptors youngsters has been integral early in the season. Fred VanVleet continues to be one of the NBA’s preeminent backup point guards, while Pascal Siakam has become a dynamic force off the bounce. There’s been no regression with Nick Nurse in place of Dwane Casey. Don’t forget about the headliners, though. Kyle Lowry continues to play inspired basketball, working as a maestro of Toronto’s attack. Few players control the pace of the game as well as the bowling-ball point guard. Lowry is never in a hurry, an expert at slicing through the interior of a defense before finding the perfect pocket for an easy assist. As for Leonard, he looks every bit the force we remember before Game 1 of the 2017 Western Conference Finals. The former Spur is a one-man wrecking crew on both sides of the floor, wreaking havoc on the defensive end while serving as an effective and efficient top offensive option. Leonard makes for a good partner alongside Lowry. Both are patient and deliberate, in no rush to force an errant shot. Leonard is increasingly adept at bullying his way to a spot inside the elbow before unleashing a string of jab steps and pump fakes to get in prime position. It’s an effective evolution that we began to see in his final healthy year with San Antonio. Boston poses the greatest threat to Toronto in the East, and a conference finals matchup could very well run seven games. Giannis Antetokounmpo will also be heard from come playoff time, as will Joel Embiid and Ben Simmons in Philadelphia. Yet through 12 games it’s hard to find a fatal flaw in Toronto. Leonard and Lowry is one of the league’s premier partnerships, pairing with a bench mob that continues to excel. There’s no more complete team in the conference. A brutal first round exit against the Pelicans last season ended Lillard’s 2017-18 on a sour note, underplaying just how lethal he was for the first 82 games. The Blazers’ go-to scorer was electric last season, carrying Portland to the No. 3 seed in the West on 26.9 points per game. Dame was recognized for his strong play with a first-team All-NBA selection—the first of his career—yet after Portland’s playoff performance, Lillard faded to the background in the conversation of the league’s elite guards. He’s risen to the forefront once again to start 2018-19. Lillard has always been a lethal shooter from deep, able to stretch the defense far beyond the three-point line for rainbow triples. Yet the true growth this season has come near the tin. Lillard can contort his body around the trees like he never could previously, looking like Kyrie Irving-lite when finishing at nearly every conceivable angle. Lillard is shooting a career high 33.3% within three feet, a career high after a 27.2% mark in his first six seasons. Portland is once again hovering near the top of the West standings, sitting in third at 8–3. Last year’s playoff debacle will lend skepticism toward the Blazers’ contender status, but make no mistake: Lillard is as good as ever, and right in line for a potential MVP season for the second-straight year. While the Blazers have gotten off the a blistering start to 2018-19, the same can’t be said down in Houston. The Rockets have clawed their way to 4–5 after a dreadful 1–5 start to the season, yet the feeling of post-conference finals malaise remains. After coming so close to dethroning Golden State, are the Rockets primed for a letdown? That may be a little premature. James Harden has missed three contests and Chris Paul sat out two due to suspension, while third guard Eric Gordon has experienced a dreadful shooting start to the season. Houston blitzed teams to an offensive rating of 114.7 points per 100 possessions last season, a league high. Expect the Rockets’ No. 21 offensive rating to improve as we head toward December. It’s fair to question Houston’s standing as the de-facto second team in the West. Key complimentary pieces Trevor Ariza and Luc Mbah a Moute are gone from last year’s roster, Gerald Green has regressed and Carmelo Anthony has been inconsistent offensively and a sieve defensively. Houston isn’t as deep as they were last year, a potential speed bump come playoff time. Yet even with the peripheral questions, Houston still boasts last year’s MVP along with perhaps the best point guard of his generation. Houston’s sagging isolation numbers should rise, and the Rockets’ record will do the same. Add in talented young center Clint Capela and the do-everything excellence of P.J. Tucker, and the Rockets should be just fine. Golden State looks primed to snag the West’s top seed this season, but there is still no greater threat to the Warriors reign than Houston. The top of June’s draft was heralded as one of the best in recent memory, deep on potential franchise building blocks with a string of exciting headliners. And while the brakes should always be pumped on claiming rookies as franchise saviors, this year’s class has fared quite well in their opening month. The top tier of the rookie class has been the two players swapped for each other within the first five picks. In Dallas, Luka Doncic has lived up to the European hype, looking wise beyond his years as a fulcrum in the Mavs’ attack. The Slovenian point-forward has elite court vision and a strong feel for the game, with late-game chops to boot. Doncic isn’t an explosive athlete. He’s slow off the first dribble, yet he plays like a heady vet, able to get to his spot more often than not. Doncic’s averages of 20 points, six rebounds and four assists per game have only been matched by two rookies since 1979-80, Larry Bird and Michael Jordan. Not exactly bad company. Dallas will end its season after 82 games, but Doncic’s ascent will make the Mavs worth watching into the spring. Doncic will be forever linked to Hawks point guard Trae Young, who has shown flashes of brilliance early in his Atlanta tenure. The Oklahoma product hasn’t been as consistent as Doncic, but he’s jumped off the screen early on. Young entered the league heralded for his breathtaking bombs from beyond the arc, pouring in Curry-esque triples with the Sooners. He’s only had one scoring outburst thus far—a 35-point effort against the tankiest version of Cleveland we’ve seen this century—though it’s not the shooting that’s been so exciting. Young has controlled Atlanta’s offense with aplomb, seeing the court at an elite level. Young leads all rookies in assists per game at 8.1, nearly twice as many as Doncic, the second-ranked rookie. Even with a roster ranked No. 21 in the league in three-point percentage, Young has excelled in generating open looks. Looking past the dynamic ball handlers, the slate of big men have been impressive as well. Deandre Ayton has been a double-double machine from the outset, while Jaren Jackson Jr. and Wendell Carter both project to be versatile building blocks for the Grizzlies and Bulls, respectively. Mo Bamba and Marvin Bagley III haven’t found their footing to the same degree as the aforementioned trio, yet Bagley III has shown spurts of scoring prowess, and Bamba is already a solid deterrent at the rim. While the 2019 draft class is already providing significant excitement, don’t lose track of this year’s group of talented rookies. It’s becoming more clear by the week just how dominant the Warriors are compared to their competition. Golden State is lapping the field in offensive rating and is already drawing discussion on which records they should break next. 12 games in, this could very well be the best Warriors team yet. Will that be reflected in their regular-season record? That will be a tall task. Matching or surpassing their 2015-16 total of 73 wins seems lofty for even the greatest collection of superstars, especially in year five of their dynastic run. Fatigue set in early and often last season as Golden State slipped to the two-seed in the West. Even with a seemingly-rejuvenated squad, an occasional night off in the winter will be expected. That’s especially true in the stacked West. Golden State could have a legitimate shot at 74 wins beating up on the dregs of the East, but there aren’t enough free nights in the league’s superior circuit. The Warriors have shattered nearly every expectation we’ve previously held. But 74 wins? That looks like a longshot.